Dr Doom switches minds with Reed Richards using psychic skills he learned from the alien Ovoids. He is defeated and inadvertently shrunken down into a sub-atomic dimension, aptly named Sub-Atomica, and sometimes called the Microverse. 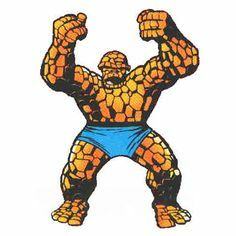 Around this time the Fantastic Four begin relating their exploits to "Lee & Kirby" for Marvel Comics publications. The FF meet the Impossible Man, a shape-changing alien from planet Poppup. The Hulk battles Tyrannus, leader of an underground race of Subterraneans. In New Mexico, General Ross asks the Fantastic Four to help him capture the Hulk. The FF and the Hulk’s first encounter is in an underground tunnel but their battle is interrupted by the criminal scientist the Wrecker. The Hulk escapes and the Wrecker is captured. Media publisher J. Jonah Jameson begins campaigning against superheroes – and Spider-Man in particular. In an effort to put himself in a more positive light, Spider-Man visits the world-renowned Fantastic Four looking for membership, but leaves when he finds out there is no salary. Worse yet, he is temporarily impersonated by the criminal Chameleon. Peter Parker battles the mechanically-aided flying criminal the Vulture for the first time. He learns to take action photos and begins selling them to Jameson's “Now” magazine (and later the Daily Bugle) and meets secretary and future interest Betty Brant. Elsewhere, Dr. Otto Octavius, a specialist in radiation research, is caught in an accidental explosion and his robotic “dummy-arms” become grafted to his body. 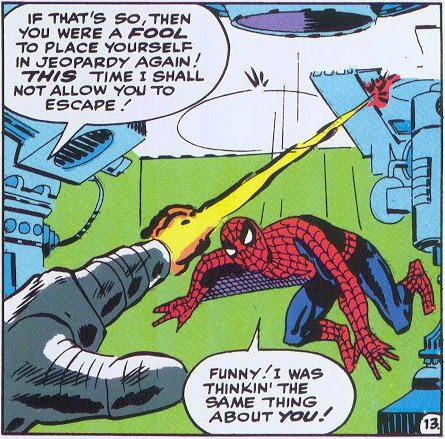 As the criminal Doctor Octopus he meets - and defeats - Spider-Man, but after hearing an inspirational speech by Johnny Storm, Peter rallies and in a second encounter defeats Octopus. Spider-Man battles the Sandman (Flint Marko), who became a being of “living sand” after being caught in a desert nuclear test. In Florida, Spider-Man first encounters biologist Curt Connors who, in an attempt to regrow his lost arm, becomes the monstrous Lizard. With his ability to communicate with reptiles, the Lizard plans to create an army of lizard-men and eradicate mankind, but is stopped by Spider-Man. Henry Pym meets socialite Janet Van Dyne and gives her the ability to become the shrinking and flying Wasp. Together they repel the alien Kosmos, who had earlier killed Janet's father. They begin a crime-fighting partnership and shortly battle the Human Top (later the Whirlwind). Dr. Strange establishes his Sanctum Sanctorum in NY's Greenwich Village and battles his old enemy Nightmare in the dream dimension. Doctor Strange battles rival mystic Baron Mordo and is aided by a latent psychic, Victoria Bentley. The Fantastic Four travel to the Earth's moon and discover the long-abandoned Kree 'Blue Area', as well as first encountering both myself, the Watcher, and the Soviet Red Ghost & his 3 Super Apes. Ivan Kragoff and his apes gain superpowers by traveling through cosmic rays in space, just as the FF had done years before. As a Watcher stationed to observe events on Earth, it is my responsibility to only watch and not interfere with Earth matters. There have been lapses. The FF return to Earth and are soon engaged in battle with the meticulously criminal Mad Thinker and his awesome artificial Android. Dr. Doom returns and battles the FF and Ant-Man in the Microverse. There, the FF befriend Sub-Atomica’s Princess Perla and defeat Doom - but back in the normal world he escapes. Convinced by J. Jonah Jameson's editorial attacks on Spider-Man, Doom mistakenly tries to enlist Parker to his cause. Spider-Man is almost killed by his armored foe, but Doom flees when the FF approach. Later, Spider-Man and the Human Torch team up for the first time when they capture the criminal Fox. In the latter part of the year the alien Skrulls realize they were tricked by Reed Richards in their first invasion and send the power-enhanced Super-Skrull against the FF. Reed uses his scientific genius to disrupt his power source and defeat him. Namor the Sub-Mariner finds his lost race the Atlanteans, including his cousin admirer, Lady Dorma, and a rival, Warlord Krang. He and the Atlanteans invade the surface word but are defeated by an invention of Reed Richards which evaporates water from the Atlantean soldiers' battle suits. When the FF pursue Namor into the open sea, he betrays his own race in order to save Sue Storm's life. The deeply offended Atlanteans abandon Namor for this act. The FF use Dr. Doom’s time platform to travel back to ancient Egypt to search for a cure to Alicia Masters' blindness, but instead find themselves in conflict with Pharaoh Rama-Tut, who it turns out is also a time-traveler from the 31st Century. With the surreptitious help of another time-traveling hero, Dr. Strange, they defeat Rama-Tut, though they fail to retrieve a cure for Alicia’s blindness. CIA agent Nick Fury (formerly Sgt.) gives his old friend Reed a visit and helps the FF defeat the Hate Monger (a Hitler clone) in San Gusto. Loki induces the Lava Man, Molto, to surface and attack Thor, but Molto is defeated and sealed underground. Thor meets the serpentine Cobra, and then the super-strong Mr. Hyde. Weapons industrialist and inventor Tony Stark is injured in Southeast Asia and captured by Wong-Chu, a Communist leader. Stark, aided by fellow prisoner Professor Ho Yin-sen, creates a transister-powered armor suit, an Iron Man. He escapes, and kills Wong-chu - though Yin-sen perishes. He meets pilot Jim Rhodes before leaving Asia. Iron Man fights Kala, Queen of the underground Netherworld. Stark encounters Jack Frost (later the Blizzard) He hires Pepper Potts and Happy Hogan as his secretary and bodyguard. The first Soviet Crimson Dynamo appears, followed by the Melter. In battle with Mr. Doll, Tony Stark realizes the necessity of designing a new lighter armor and creates a new “red and gold” armor. In the American Southwest, Loki tries to trick Thor into a trap by framing the Hulk. This inadvertently draws Thor, Iron Man, Ant-Man and the Wasp together, and after defeating Loki, they band together as the Avengers. 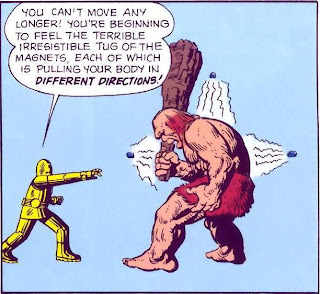 Henry Pym discovers the ability to grow to 12 feet and changes his name to Giant-Man. The Avengers meet the alien Space Phantom who impersonates members of the Avengers (and is secretly allied with Immortus) . The alien is defeated but the other members’ inherent distrust of each other causes the Hulk to quit in disgust. Charles Xavier discovers Warren Worthington III– the winged avenging Angel - working as a vigilante and takes him on as a student and X-Man. Hank McCoy (the Beast) and then telekinetic Jean Grey (Marvel Girl, later Phoenix) join Xavier's school for mutants and so the mutant hero team the X-Men are formed. Soon they have their first battle with their most dangerous foe, the mutant master of magnetism, Magneto, at Cape Citadel.